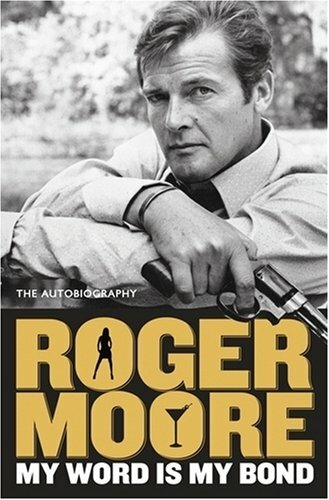 My Word Is My Bond is the autobiography of Sir Roger Moore and was published in 2008. As someone who is partial to an episode of The Saint now and again and who still loves his super suave Bond saving the world from Carl Stromberg and Hugo Drax in a blue blazer, I have no problem in declaring that I am a Roger Moore fan. In fact, there wouldn't be a Bond series today for Barbara Broccoli to ruin if Moore hadn't got it through the seventies. My Word Is My Bond is a fairly undemanding but pleasant read that - much like its author - is self-deprecating, modest, slightly bawdy, conversational, nostalgic and generally pleasant. Moore doesn't take himself too seriously and trawls through his long life (he was 80 when this came out) and career with many anecdotes, numerous famous faces (everyone from Elizabeth Taylor to Tony Curtis to Noël Coward to David Niven), details and memories from the many films he's made and, as you'd expect, sections on his long service as a UNICEF Goodwill Ambassador. It's fun when the book moves onto his television days, especially The Saint, in which he played the debonair troubleshooter Simon Templar and often directed the episodes too. Moore had been constantly linked to James Bond since the inception of the series (Ian Fleming actually had him in mind before Dr No) and it was The Saint that probably convinced the Bond producers that Moore could be a solid 'holding' Bond for them in the seventies after the Lazenby affair and Connery refusing to come back. Moore recalls cold winter days in Elstree shooting The Saint and always having to pretend on minimal budgets that Templar was in some exotic land far away. This famous era of British fantasy television is fascinating to hear about at first hand. 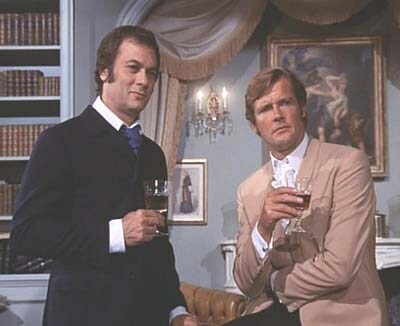 Before he landed James Bond in 1972 Moore managed to do another television series, the somewhat kitsch The Persuaders! with Tony Curtis. His memories of this show are fun too - especially the incident where Curtis calls outraged guest star Joan Collins a certain four letter word! 'When I have nothing nice to say about a person,' writes Moore. 'I'd rather not say anything at all.' It explains the absence of dirt dishing with few people seeming to irritate him in the book. One who did though was Grace Jones, his co-star on A View To A Kill, which seems to have been a difficult experience for Sir Rog at times. 'I'm afraid my diplomatic charm was stretched to the limit. Every day in her dressing room - which was adjacent to mine - she played very loud music. I was not a fan of heavy metal. One day I snapped. I marched into her room, pulled the plug and then went back to my room, picked up a chair and flung it at the wall.' Moore has warm memories of the legendary James Bond producer Cubby Broccoli although he does take issue here with Broccoli's assertion that he gave Roger the heave-ho after A View To A Kill for being too old (he was 57 at the time). Moore maintains he had in fact retired himself from the series and no one asked him to leave. 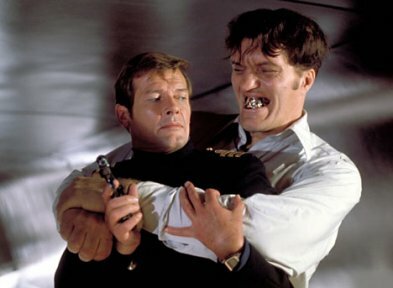 Moore has nothing earth shattering to say about his time playing James Bond (seven films between 1973 and 1985) and regards it to be a happy experience in the book with a friendly atmosphere on a set comprised of many regulars who worked together on numerous Bonds like a family of sorts. Moore recalls his various injuries and ailments making the films and shares many anecdotes about everything from draughty love scenes at a chilly Pinewood Studios to Christopher Lee singing Italian opera in bed while on location in the Far East shooting The Man With The Golden Gun. Some of Moore's passages about his work as a UNICEF Goodwill Ambassador are quite touching at times towards the end. He explains that Audrey Hepburn had persuaded him to become involved in 1991 and when she died in 1993 he felt he had to continue her work. Some readers might be a little disappointed that Moore doesn't reveal an awful lot in the book. He doesn't indulge in tittle-tattle or gossip, slag people off or drop any personal bombshells. It's not really that type of book although there are occasional moments of sadness. My Word Is My Bond is Moore chatting amiably about his life and career and sharing anecdotes. What I quite liked about the book too is that he manages to mention more or less everything he's been in, even films that people might not be aware of like The Naked Face or Bed and Breakfast. This is not the most demanding or weighty (just over 200 pages) memoir to ever hit the bookshelves but My Word Is My Bond is a fun read for anyone interested in Roger and some of the more famous roles he's taken on in his long and entertaining career.